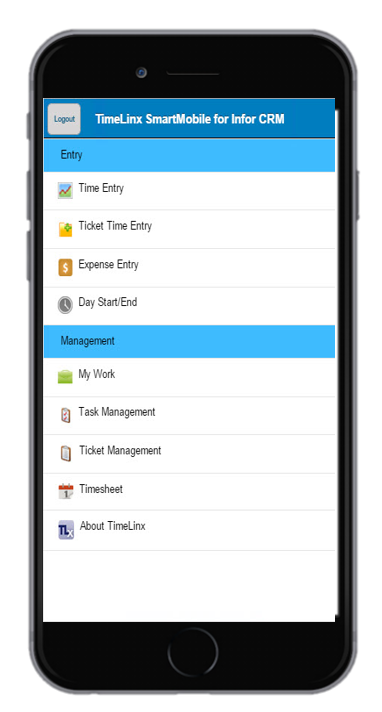 TimeLinx SmartMobileTM combines Infor CRM or Sage CRM with TimeLinx PSM to bring a full-featured time and expense application to iOS and Android smartphones and tablets. Many mobile applications capture time. Many web solutions capture time and expenses. SmartMobile does so much more by integrating project and service records with your CRM database and incorporating the full logic of our rules-based TimeLinx Revenue Optimization Engine™. Easy global Time Entry plus detailed notes – instantly! Have to capture work for multiple items but don’t need full Tasks? Use a Task Checklist to capture those items within a single Task. For example, if you’re installing an ERP system with 5 modules, each module can be a checkbox indicating it’s “complete” when checked. Simple! Capturing a customer signature can enforce the customer’s obligation to pay for work. With the Signature option within SmartMobile, your consultant can ask the customer to sign on the mobile device and TimeLinx will store the signature directly into the server database, linked to all elements being signed for (time, expenses, materials, products, etc.). Eliminate paper and remove yet another efficiency roadblock! Add TimeLinx Alerts, and we’ll email the entire signed form to the customer and your finance department within seconds of signing! In a compact format all in one place, a SmartMobile user can instantly see all work assigned or scheduled for them and record time, expenses, and details right from that screen! Now applied to all transaction entries, this single button provides data entry as rapid as a spreadsheet for entering multiple records at once, whether time, expenses, materials for a job, or products delivered or updated. Need to make a correction to a prior’s week’s time? No problem. If your time records have not been locked because a manager has started an approval process, SmartMobile users can edit previous time records to correct or update as needed! Grab a file or shoot photos on the job and they are captured and sync’d back to the office as a permanent part of the job record! Perfect for job site details, time records, expense receipts and more. Using the latest technologies, our fast interface has a modern design that helps users navigate easier than ever before. Ask for a demonstration of TimeLinx SmartMobile for Infor CRM or Sage CRM to outfit your global service staff!